I would really like to be able to have different scales for individual pens in the same trend. In particular I want to trend my compressor’s RPM (0-3600) and the capacity (0-100%) and if I put them in the same trend the capacity is barely a blip on the trend. This is not very useful, yet the two measurements are related and I would like to be able to see them on the same trend. For two pens, be sure and use left and right. They can be set totally different scales. The challenge is when you have 3 or 4 pens. Your request has been on the list for about a year, so yeah, thanks for the reminder. Thanks. I didn’t see a way to set them manually, but in Auto they seem to work. I didn’t realize the “Direction” box was key to this operation. It needs to be labeled a little clearer. 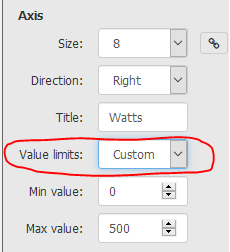 I thought that box was setting which side the values would show up on instead of the settings for each side.